The (Mad) Thinker has Daredevil strapped to a table, and Ben trapped in a locked room thats filling with deadly gas. The Thinker believes that Daredevil has precognitive abilities, and is demanding Daredevil demonstrate them or he'll kill Ben. Daredevil cleverly tells the Thinker that there's a gas leak and they'll all die, and while the Thinker ponders that bluff, Daredevil's hyper-senses let him learn that there's someone about to enter the room, and he quickly tells the Thinker that as 'proof' of his precognitive powers. The 'someone' turns out to be a kid who followed Ben and DD when Ben broke out of jail, and the Thinker quickly locks the kid up. Meanwhile, the Thinker pumps out the gas and frees Ben, but when the Thing predictably tries to clobber the Thinker, the Thinker is prepared and hypnotizes Ben. 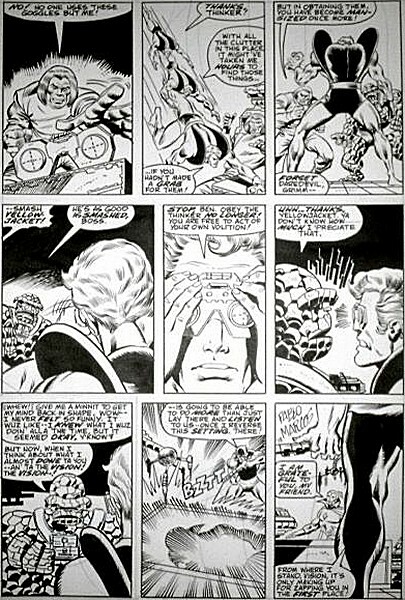 With Ben under his control and the kid as a hostage, the Thinker frees Daredevil and sends him and Ben, with pre-prepared weaponry, off to capture his ultimate target: the Vision. The Thinker has determined that only the Vision and Yellowjacket will be present in Avengers Mansion, and has set up a way that he can monitor DD through Ben at all times.. This is the finale of a three-part storyline that ran through MTIOs 37 and 38 as well. The solution that proves to be the Thinker's downfall has to be as clever as I've seen in a while. The Thinker's 'x-factor's are usually pretty much a deus ex machina on the writer's part. This one was set up two issues ago and the Thinker's downfall comes solely from within- he let himself be fooled by appearances instead of facts. Its one of the few times the Thinker is truly defeated and it truly works. The hypnotized Ben is kind of fun- he's obviously and completely still Ben, the sense of humor and personality is there. He's just working for the Thinker now! Original art from your editor's collection. Ben getting de-hypnotized, and I won't even try to explain the weirdness with the costumes of Yellowjacket and Daredevil (that's DD in the next-to-last panel). Read the issue!